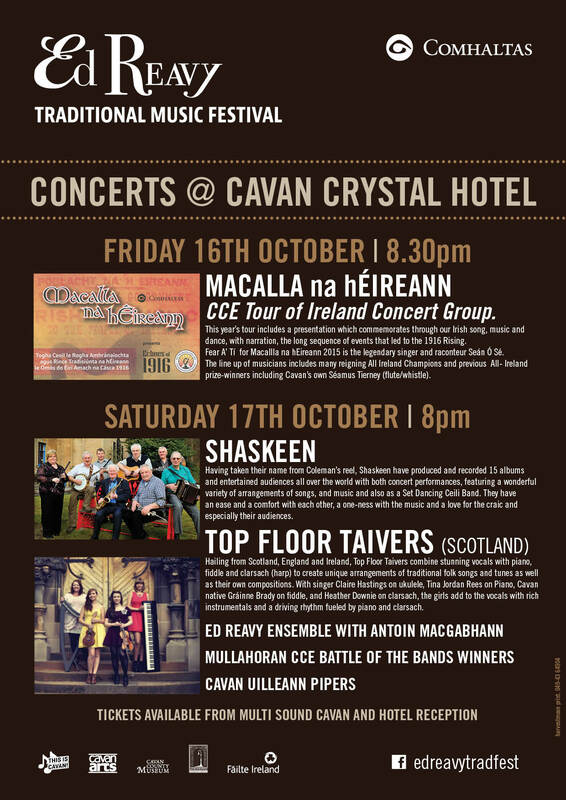 Friday October 16th 2015:Cavan Crystal Hotel @ 8.30pm Comhaltas Concert Tour of Ireland 2015. Following on from the fantastic success of previous year’s Concert Tours, this year’s tour promises to be a truly wonderful night of Music, Dancing, Singing and Storytelling, featuring the cream of traditional music talent drawn from all four Provinces of Ireland, and beyond. Each year the tour assembles a fine mix of established artistes together with up-and-coming young stars. These are blended together into a fast-moving and colourful show that appeals to both the connoisseurs and peripheral fans of Irish traditional entertainment. This year we are delighted to have a Cavan representative on the tour – Seamus Tierney from Cavan Town CCE, playing the Flute and Whistle. Tickets will be available from all CCE Branches throughout the County, as well as Multi Sound, Main Street Cavan 049-4361312. 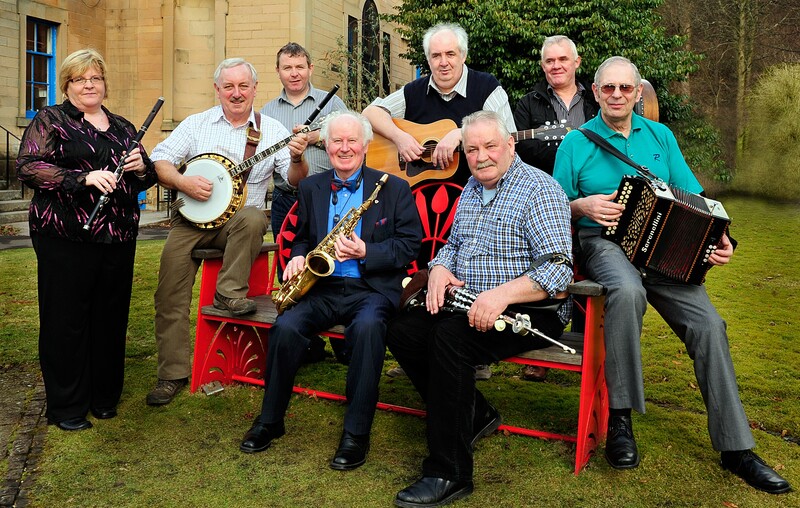 Shaskeen has been hugely influential in the preservation and development of traditional Irish music at home and abroad since they first started in 1970. A unique spirit in traditional Irish music, Shaskeen has something special. Having taken their name from one of Coleman’s reels, produced and recorded 15 albums and entertained audiences all over the world with both concert performances, featuring a wonderful variety of arrangements of songs, hornpipes, jigs and reels, and also as a Set Dancing Ceili Band with plenty of music to get your dancing shoes on. They have an ease and a comfort with each other, a one-ness with the music and a love for the craic and especially for their audiences. Hailing from Scotland, England and Ireland, Top Floor Taivers combine stunning vocals with piano, fiddle and clarsach (harp) to create unique arrangements of traditional folk songs and tunes as well as their own compositions. With singer Claire Hastings on ukulele, Tina Jordan Rees on Piano, Cavan native Gráinne Brady on fiddle, and Heather Downie on clarsach, the girls add to the vocals with rich instrumentals and a driving rhythm fueled by piano and clarsach. The song based four-piece collaborated in 2013 whilst all living in Glasgow, recording a four track EP in the summer of 2014. The Ed Reavy Ensemble is a collective of young and talented musicians brought together under the direction of Antoin MacGabhann to present a selection of Reavy tunes which captures the style and vision of the renowned composer himself, Ed Reavy. In Feb 2015, Mullahoran CCE ran a very successful night in Crover House Hotel where bands in 2 age categories U-13 and U-18 battled it out in front of adjudicators Tadhg Mulligan, Stiofán Ó Fearail and Sean O Ceitinn for the respective coveted titles. The winning group of each category will perform their entertaining selections for your enjoyment. Saturday 17th October is International Uilleann Piping Day, and in recognition of the fact, a number of local and highly talented Uilleann Pipers will perform a short selection of tunes. Tickets: € 12.50.Available from Multi Sound Main Street Cavan, 049-4361312, or at our shop in Cavan Crystal Hotel from Friday evening at 5pm.